Windows Azure Web Sites are, I would say, the highest form of Platform-as-a-Service. As per documentation “The fastest way to build for the cloud”. It really is. You can start easy and fast – in a minutes will have your Web Site running in the cloud in a high-density shared environment. And within minutes you can go to 10 Large instances reserved only for you! And this is huge – this is 40 CPU cores with total of 70GB of RAM! Just for your web site. I would say you will need to reengineer your site, before going that big. So what are the secrets? 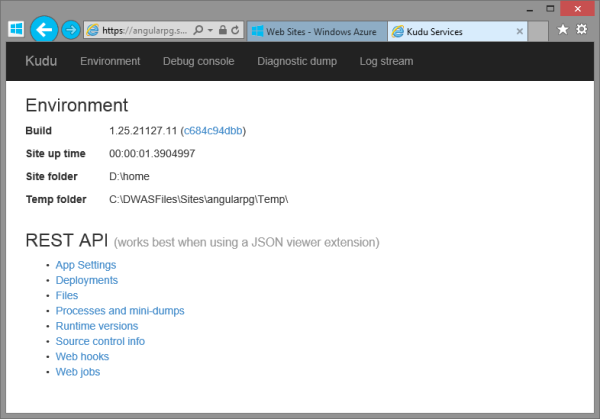 What very few know or realize, that Windows Azure Websites runs Project KUDU, which is publicly available on GitHub. Yes, that’s right, Microsoft has released Project KUDU as open source project so we can all peek inside, learn, even submit patches if we find something is wrong. There are multiple ways to deploy your site to Windows Azure Web Sites. Starting from plain old FTP, going through Microsoft’s Web Deploy and stopping at automated deployment from popular source code repositories like GitHub, Visual Studio Online (former TFS Online), DropBox, BitBucket, Local Git repo and even External provider that supports GIT or MERCURIAL source control systems. And this all thanks to the KUDU project. As we know, Windows Azure Management portal is protected by (very recently) Windows Azure Active Directory, and most of us use their Microsoft Accounts to log-in (formerly known as Windows Live ID). Well, GitHub, FTP, Web Deploy, etc., they know nothing about Live ID. So, in order to deploy a site, we actually need a deployment credentials. There are two sets of Deployment Credentials. User Level deployment credentials are bout to our personal Live ID, we set user name and password, and these are valid for all web sites and subscription the Live ID has access to. Site Level deployment credentials are auto generated and are bound to a particular site. You can learn more about Deployment credentials on the WIKI page. Nice! This is a command prompt that runs on your Web Site. It has the security context of your web site – so pretty restricted. But, it also has PowerShell! Yes, it does. But in its alpha version, you can only execute commands which do not require user input. Still something! Here you can watch in real time, all the logging of your web site. OK, not all. But everything you’ve sent to System.Diagnostics.Trace.WriteLine(string message) will come here. 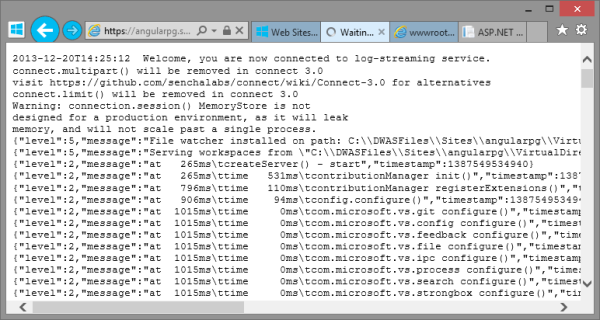 Not the IIS logs, your application’s logs. So what are web site Extensions? In short – these are small (web) apps you can write and you can install them as part of your deployment. They will run under separate restricted area of your web site and will be protected by deployment credentials behind HTTPS encrypted traffic. you can learn more by visiting the Web Site Extensions WIKI page on the KUDU project. This is also interesting part of KUDU where I suggest you go, investigate, play around! Not long ago Visual Studio Online went GA. What is not so widely mentioned is the hidden gem – preview version of the actual Visual Studio IDE! Yes, this thing that we use to develop code has now gone online as preview (check the Preview Features page on the Windows Azure Portal). - What can we do now? 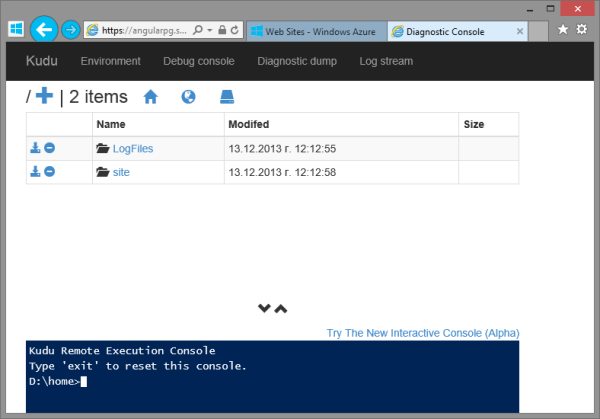 - Live, real-time changes to a Windows Azure Web Site! First you need to create new VSO account, if you don’t already have one (please waste no time but get yours here!). Then you need to link it to your Azure subscription! Unfortunately (or should I use “ironically”?) account linking (and creating from within the Azure management portal) is not available for an MSDN benefit account, as per FAQ here. 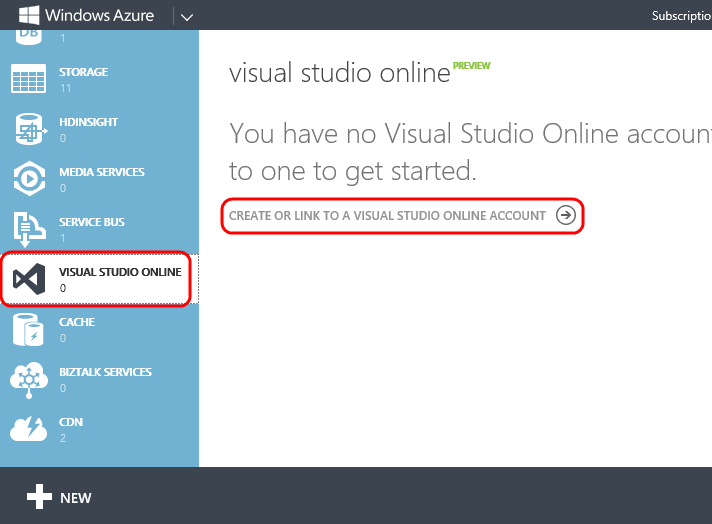 Once you get (or if you already have) a VSO account, you can link it to your Azure subscription. Just sign-in to the Azure Management portal with the same Microsoft Account (Live ID) used to create VSO account. 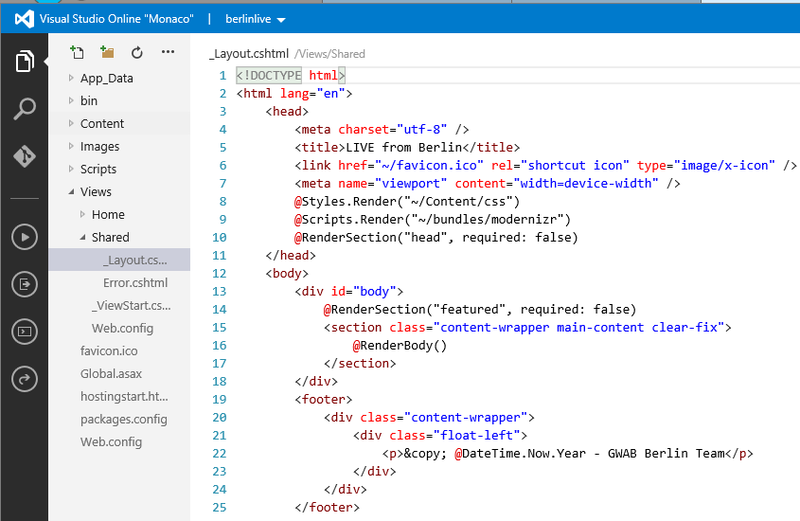 There you shall be able to see the Visual Studio Online in left hand navigation bar. Click on it. A page will appear asking you to create new or link existing VSO account. Pick up the name of your VSO account and link it! 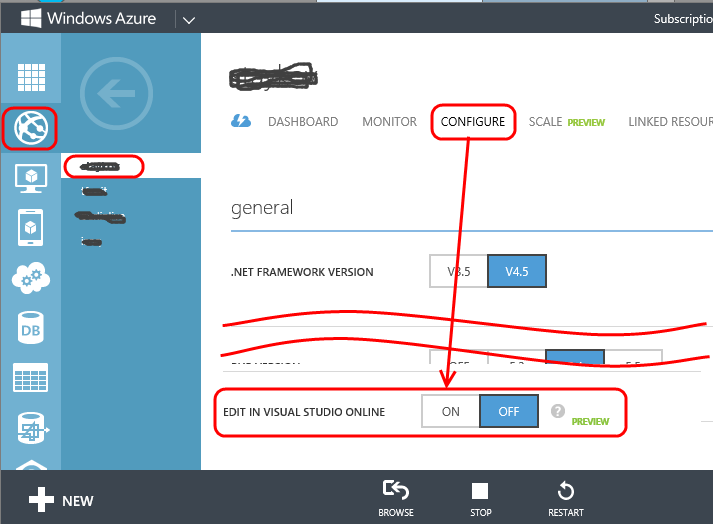 You have to enable VSO for each Azure Web Site you want to edit. 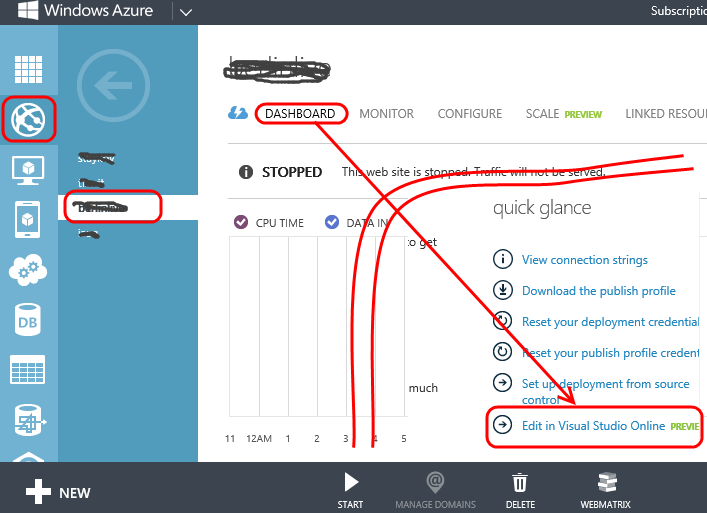 This can be achieved by navigating to the target Azure Web Site inside the Azure Management Portal. Then go to Configure. Scroll down and find “Edit Site in Visual Studio Online” and switch this setting to ON. Wait for the operation to complete! The VSO IDE is protected with your deployment credentials (if you don’t know what is your deployment credentials, please take a few minutes to read through this article). Oh, catch? What do you mean by “Where is the catch”? The source control? There is integrated GIT support! You can either link your web-site to a Git (GitHub / VSO project with GIT-based Source Control), or just do work with local GIT repository. The choice is really yours! And now you have fully integrated source control over your changes!